We started out the day at Pikes Peak State Park where we walked to yet another overlook of the Mississippi. This overlook also happened to be an earth cache, so I check marked Iowa off the list presuming the creator of the cache takes my answers. All the answers but one were on the associated signs; however, I am also to look at the bend and valley depth to determine the speed of the current here. Anyone want to look at the picture and take a guess? That’s what I’m doing! From Pikes Peak State Park we followed the river south to Dubuque, Iowa. What an interesting, historic town. We first visited the Fenelon Place Elevator, the world’s steepest, shortest scenic railway that transports passengers 296 feet in length and elevates them 189 feet from Fourth Street to Fenelon Place. petitioned the city for the right to build the Swiss-style, one-car cable. Graves hired John Bell, a local engineer to design what would be a plain wood building that housed a coal-fired steam engine boiler and winch and a wooden car which was hauled up and down on two rails by a hemp rope. Upon completion, Graves had his gardener raise and lower him. Soon his neighbors hitched rides. Approximately two years into operation, the elevator burned from the fire that was banked in the stove for the night. Mr. Graves rebuilt the elevator, but this time opened it to the public for the cost of five cents. The elevator again burned in 1893, only due to the recession, Mr. Graves could not afford to rebuild it. Neighbors had come to rely on the elevator to get them to school, work, church and the market, so ten of them banded together to form the Fenelon Place Elevator Company. Graves gave them the franchise in exchange for the right of way for the track. The group traveled to the 1893 Columbian Exposition in Chicago to look for new ideas. They returned with a street car motor, a turnstile, and a steel cable. They installed additional rails to allow for the operation of two counterbalanced cars. By 1912, C.B. Trewin, who had built the house next door, had become the sole stockholder as he had purchased the shares from the original ten investors as they passed or moved away. He made additional improvements, including adding a room for men to play cards without the wives interfering. In 1962, the house burned down, yet again, this time due to an electrical fire. With the next rebuild, the price went up to ten cents. In 1977, the original gear drive was replaced by a modern gear box with a DC motor. The elevator was featured in the movie F.I.S.T. as well. I personally liked the elf exit. parking garage where a cache was hidden on the top floor (I was on the bottom L), and through Cathedral Square before returning to our ride to the top of the bluff. Since Petey hadn’t been feeling the greatest the last few days, I took advantage of the big city and found a vet. Normally I wouldn’t have wanted to spend the middle of the day waiting on a pet doctor, but frankly the air conditioning was welcoming for both Petey and me. I was inclined to say take as long as you want! As suspected, Petey has another urinary tract infection. After our time at the vet, we went in search of a cache. I wanted to be sure I found one regular one from Iowa in case my earth cache answers were incorrect. This proved slightly challenging as I had been trying most the day. I was very surprised that there wasn’t a micro cache at the cable car. There was a muggle in Cathedral Square and the last few logs claimed a wasps’ nest was in the area, so I skipped that one as well as the one on the top floor of the parking garage. it took four of us a while to find it! In the late afternoon we finally left Dubuque and ended in Galena for the evening. What a pleasant surprise! 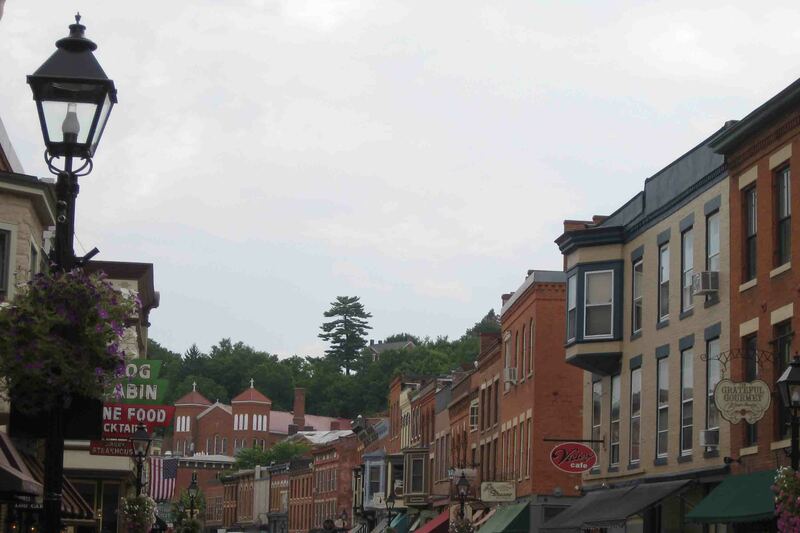 Galena (Latin for lead) was “a 19th-century boomtown beautifully preserved as a living museum”. The town sits above the Galena River, a Mississippi tributary that once carried ore to market. The bustling port died with the railroad. Now, the charming town caters to tourists. Main Street is lined with coffee houses, wineries, book stores, antique stores, galleries, canneries, restaurants and the like. In addition, the Dowling House (the oldest in Illinois) and the Galena History Museum are just a block off Main. I strolled around town and stopped in a few stores. One cannery was full of hot sauces…my personal favorite was “Pick This”. The bottle came with a rubber nose complete with boogers hanging from it. Is that the same Galena that’s Ulysses S. Grant’s home town? We went there on a school trip. I grew up in Chicago, which is *flat*!!! So I loved the hills of Galena!